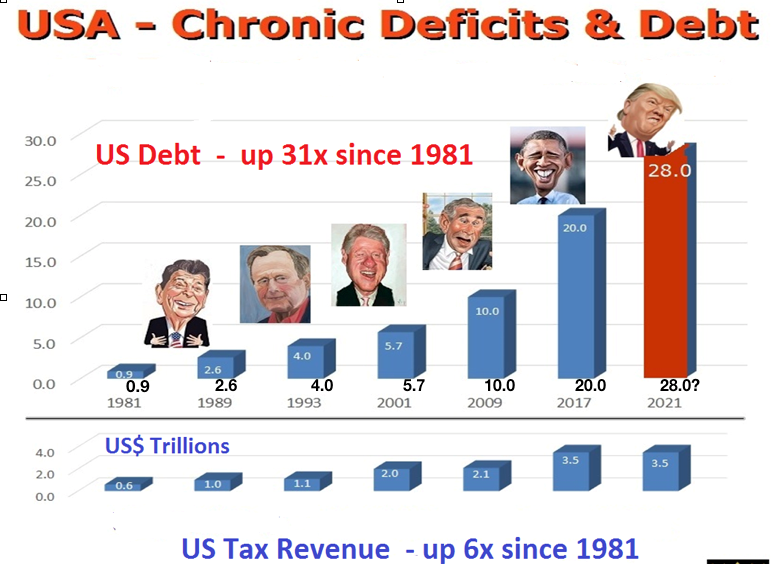 During Obama, debt went form $10T to $ 20T. Whether Trump will manage to keep it below $28T by 2021 is questionable. What is more certain is that by 2025, whoever is president, debt will most certainly fulfil the historic trend of doubling every 8 years. That means a $40T debt in 2025. As I have discussed in recent articles, risk is currently at an extreme in most sectors of the financial world. The main indicators which are now signalling a turn in markets are interest rates and inflation going up and the dollar falling. These moves will accelerate in coming months and years until we see both interest rates and inflation in the teens, at least, and the dollar finishing the 100 year move to zero. The volatility in stock markets that we have seen in recent days is another indication of a turn in the economy. In 5 of 6 trading days last week, the Dow moved 500 to over 1,000 points per day. We are likely to see further pressure in the short term before either the market turns up again to finish the melt-up move sometime this year. Or alternatively we have now seen the top and markets move down strongly from here. Either way, stocks are now very high risk and investors should either reduce positions or get out of the market. With stocks falling and cryptos halving in value, the precious metals are now starting to react. As is common when stocks fall, metals also go down initially before they resume the uptrend. Gold in dollars is now up $120 since early December. For gold to really move, it must move in all currencies. But that has not been the case. Gold in Euros, Swiss francs and Pounds are just slightly above the early December levels. This means that it is actually not gold which has moved up since December. Instead, what we have seen is dollar weakness. Thus dollar based gold investors have benefitted from the move since December but not investors in other currencies. For the last two years, gold in Euros has traded in a narrow range of EUR 160 between EUR 1,060 and 1,220. In the last 6 months this range has narrowed further and gold in Euros is now poised for a breakout to the upside above EUR 1,200. 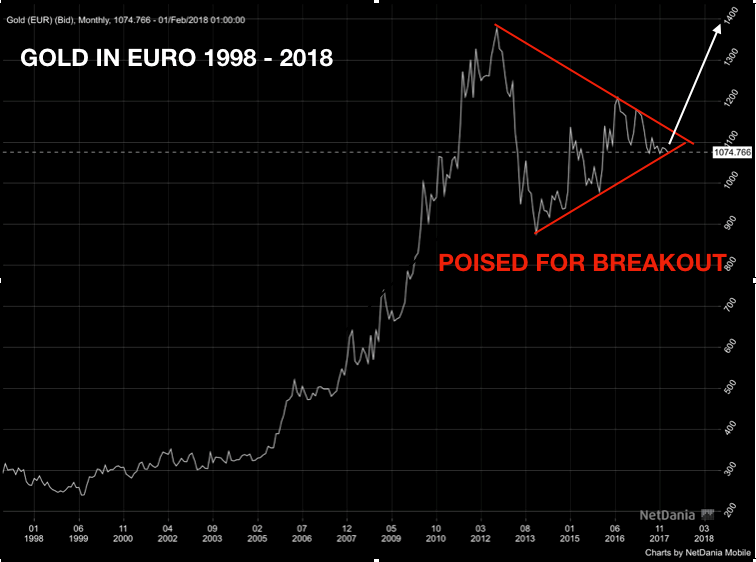 When that move starts, gold is likely to move up not just against the Euro but in all currencies. The Gold / Silver ratio is often a good indicator of the direction of the precious metals. This ratio has now reached just above the 80 level for the fourth time this century. Every time the ratio has reached the 80 level there has been a sharp reversal. Looking at the chart, a reversal is likely within the next few weeks. That will result in silver taking the lead and moving up fast with gold following at a slower speed. 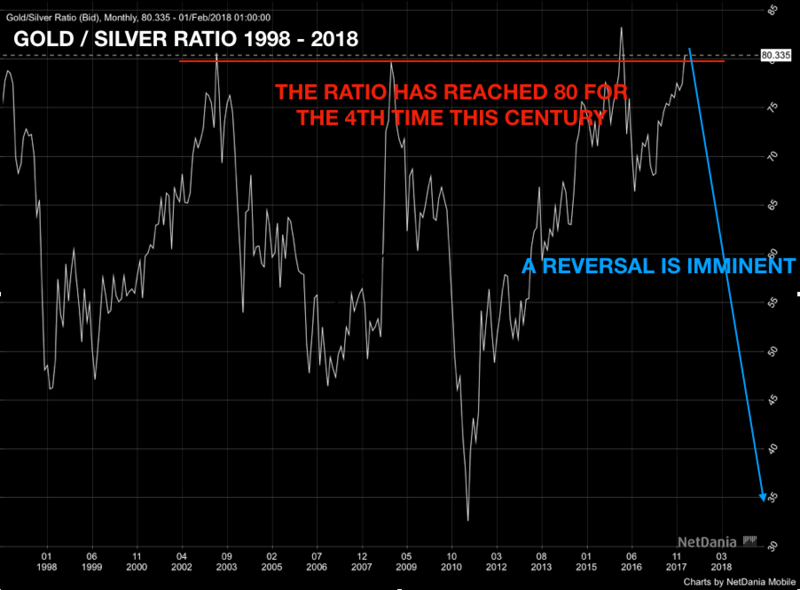 So it is probable that silver will soon start the move to new highs, providing major capital appreciation combined with excellent wealth preservation. But it must be physical silver since there are likely to be major shortages once the move starts. Swiss refiners are reporting solid demand for gold. As usual most of the buying is coming from the East and China in particular. There is a constant demand for the 3,000+ tonnes of gold that is produced by the mines, mainly to the East. 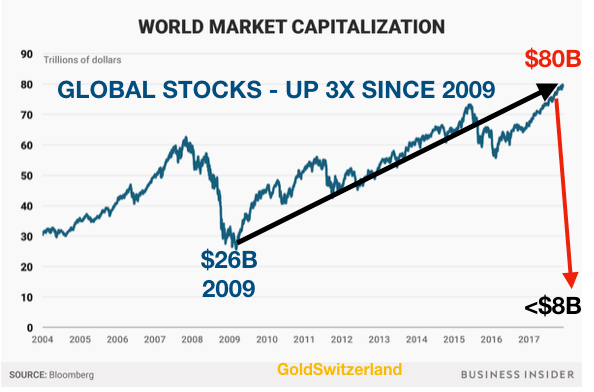 Once the paper gold market fails, which could start in 2018, the current gold price will never be seen again. 2018 is likely to be the year when the 2007-9 crisis returns with a vengeance. But this time it will be a lot more serious. Central banks will panic and print money at a level never seen before in history leading to collapsing currencies and hyperinflation. The time when gold and silver can be bought at current low prices is soon coming to an end and at some point it will be virtually impossible to find precious metals at any price.